Did you watch the Royal Wedding? I did catch some of the Spectacle on TV, but am not an early morning person, so I didn’t wake up at the start. It was beautiful too, and you can see it on Hulu if you didn’t get to see all of it at the time. I do find fashion to be an interesting bit of the Royals, and Megan Markle’s gown was both elegant and stylish. I also loved the Stella McKartney halter dress she wore. I have posted about the Queen Mother in The Crown Post, as well as introducing you to the company, Cornelia James, who makes the gloves the Queen ( and now I) wear. There is an American fascination, though with the English Royals. Do you follow them? It has been royally unpleasant here, ( ;-)as far as the weather has been concerned!! It had been raining all week this past week, so taking photos became a bit of a challenge. My hubby would look at the hourly and we would make a run for it! 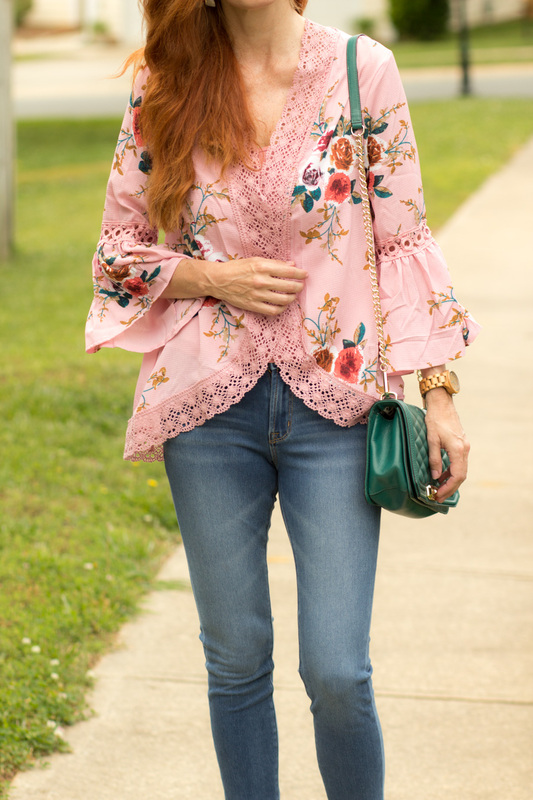 Those of you that love to wear casual looks, with jeans and a cute top, can find that wearing a kimono over jeans and a cami or tank, will elevate the look a bit more. 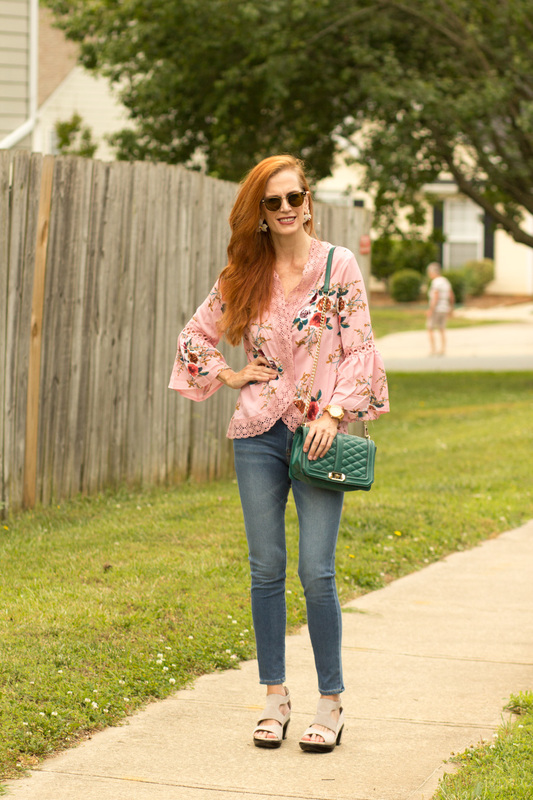 Kimonos are a trend that is a fun way to add another layer, add color, and as I mentioned, elevate the look of jeans and a tee, if that may be your “uniform”. They can take the place of a blazer or cardigan, and let’s face it, they are fun! 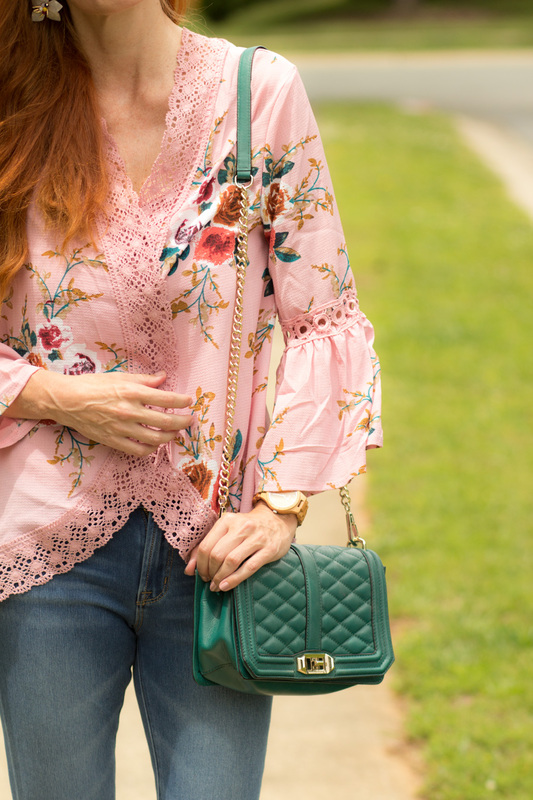 I found this lacy number on Amazon, and love the sleeve detail, colors and style. I have one other kimono, that you can see in THIS POST, for winter, and enjoy the style. I love that the cut is not straight across, making it more of a boxy look. The lace detail and rounded hem makes it a more attractive style to me. Wear with bermuda shorts and tank. Wearing a linen neutral outfit with kimono over top for summer for added color. I received my “Hampton Style” prescription sunglasses from Eyebuydirect, and bought one other pair for summer. I love this style, as it is a smaller frame that fits my face. I will be writing about how to buy sunglasses on-line in a future post. I have also purchased some new earrings from Baublebar for Spring. 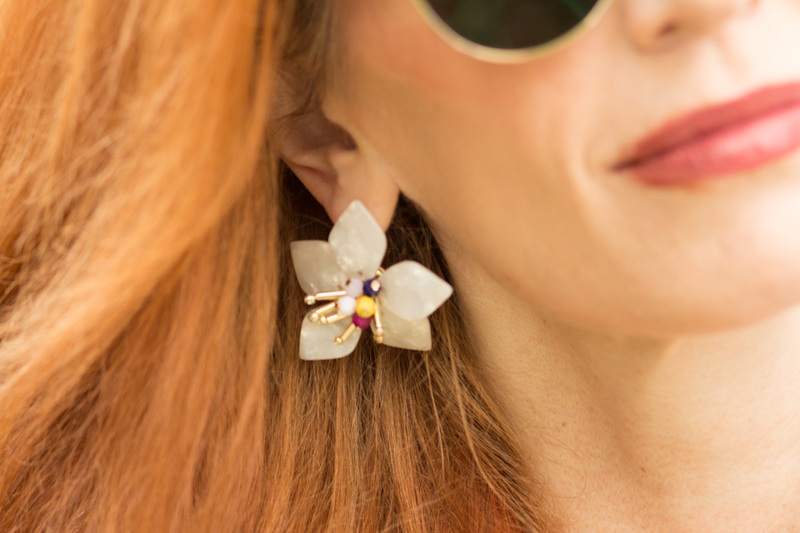 I love statement earrings and these white resin flowers were too pretty to pass up! You know these sandals from JAMBU are on repeat all summer. The memory foam and style make them easy to pair with so much! Would you wear a kimono? How would you style it? Do STOP BY TOMORROW FOR MY WEEKLY TURNING HEADS TUESDAY LINKUP! A PLACE TO ENJOY BLOGS FROM FASHION, TO BEAUTY TO LIFESTYLE. JUST CLICK ON THE BLOG IMAGES TO VIEW. SEE YOU THEN! Hello, My name is Jess and I am a 50 yr old fashion blogger who believes that fashion is all about expression and having fun. I have a Connective Tissue disease - Ehlers-Danlos and I want to tell you that it does not define me! I'm also here to tell you Fashion at 50 doesn't mean frumpy! I love color, mixing textures, wearing skirts and dresses ( mostly) and strive for a feminine look. I love Old Hollywood Hair. 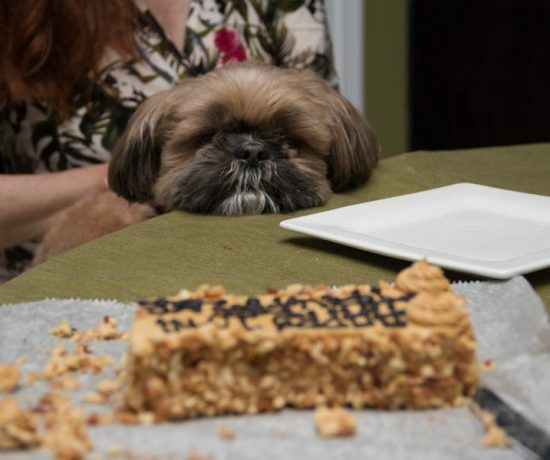 I live in NC with my husband and my other two loves: Gibson and Truffles, my two shih tzu fur babies. Turning Heads #linkup-A Holiday Look with Lace,Fur+Giveaway! Love this kimono Jess! 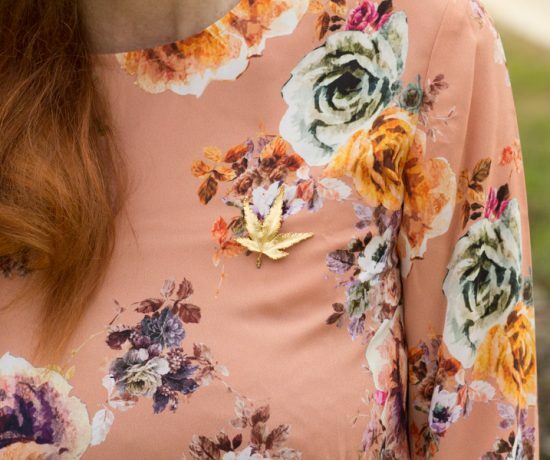 You’re right…it can be styled so many ways and it’s a great color for summer! Can’t wait to hear your tips on buying sunglasses online! I haven’t had the best of luck! Hope your week is good so far! Jess your Kimono Looks perfect with your jeans. And the earrings are so cute. Your Inspiration is fabulous. 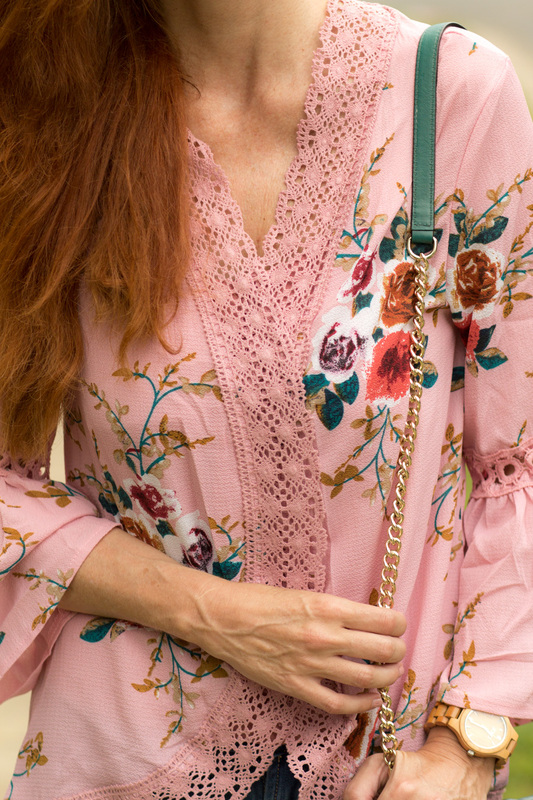 I love this kimono – the color the lace detail and the print. It a unique style and a classy element to a casual outfit. I didn’t watch the royal wedding but I did get a glimpse of Meghan’s dress. It was beautiful! Fabulous look Jess and you are rockin’ those jeans my friend! Love this look. I watched snippets of the wedding and thought it was so sweet and beautiful. Something pleasant in a world of sadness. Have a great week! I love this kimono Jess! Well, let’s just say I love almost all kimonos, ha ha!! But this one with the lace is so you!! Oh Jess, I know what you mean about the weather. We’ve had nothing but rain for the last week and I am over it. So hard to take photos and I hate dressing for the rain. Anyhow, enough griping. This kimono is so pretty and I love that it is a shorter length. The color and lace are so feminine! I also love those ON Rockstar jeans on you – they look terrific. I saw a bit of the wedding, really loved everything I saw, especially the choir and how the ladies were dressed – I loved that they weren’t wearing choir robes! Happy Monday!